Pitchfork Music Festival has just announced its full lineup for 2017. Taking place on July 14-16 in Chicago’s Union Park, the festival is being headlined this year by LCD Soundsystem, Solange and A Tribe Called Quest. 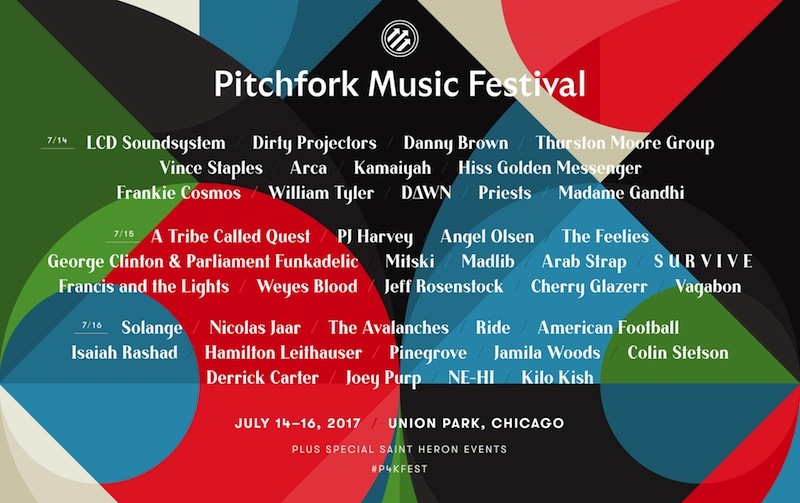 Also featured on the Pitchfork Festival 2017 lineup are Angel Olsen, Dirty Projectors, The Avalanches, PJ Harvey, Danny Brown, Vince Staples, Thurston Moore, Mitski, Nicolas Jaar, Ride, American Football, George Clinton, The Feelies, Arca, Kamaiyah, DAWN, Priests, William Tyler, Isaiah Rashad, Hamilton Leithauser, S U R V I V E, Jamila Woods, Colin Stetson, Hiss Golden Messenger, Frankie Cosmos, Arab Strap, Madlib, Jeff Rosenstock, Cherry Glazerr, Vagabon, Madame Gandhi, Pinegrove, Derrick Carter, Joey Purp, NE-HI and Kilo Kish. The full lineup is available to see, organized by day, on the Pitchfork Festival website. Single-day and weekend passes available to purchase here.